The Canal Lateral a la Loire going over the Loire River in France was the longest and one of the most impressive water bridges of the world, until the Magdeburg Bridge was built. It held the title of the longest water bridge for almost 150 years from the time it was built. The Magdeburg Bridge opened in October 2003. It connects the Mittellandkanal to the Elbe-Havel Canal, over the river Elbe. It is a whopping 912 meters long and is until now, the longest navigable water bridge/aqueduct worldwide. The experience of going over this magnificent water bridge is unforgettable. It saves the time of many ships, which had to earlier take a detour of 12 kms, and sometimes could not make the crossing due to low tide. As a result, they had to offload cargo, which meant more wastage of time. 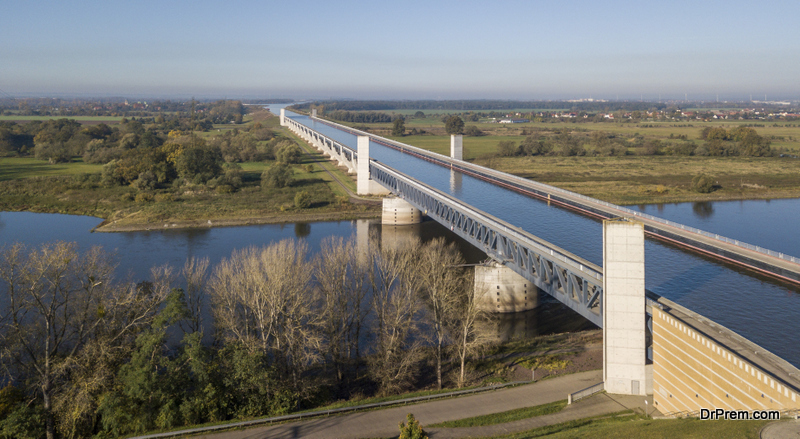 The cost of building the Magdeburg water bridge was 500 million Euros and the time taken was six years. It now performs the major function of connecting the inland harbor network of Berlin to the ports on the river Rhine. It’s undoubtedly one of the most impressive water bridges of the world. 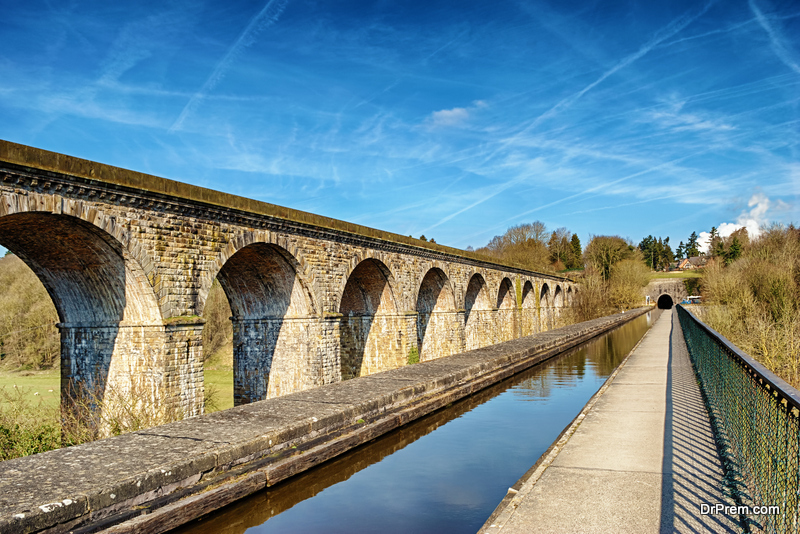 This aqueduct is a fascinating, moveable bridge in Barton, situated in England’s Greater Manchester. This aqueduct is a feat of architecture of the Victorian times, making it one of the most impressive water bridges of the world. Sir Edward Williams designed the bridge. Derbyshire’s Andrew Handyside built it in 1894; and it is regularly used even now. Earlier, a stone bridge hampered the passing of bigger, modern ships. The swing aqueduct was built to allow ships of all sizes to cross over. The water bridge swings open at 90 degrees to allow bigger ships to pass through, and small ships can pass easily over the bridge. The bridge weighs 1,450 tones and each end of the bridge holds an incredible 800 tones water. 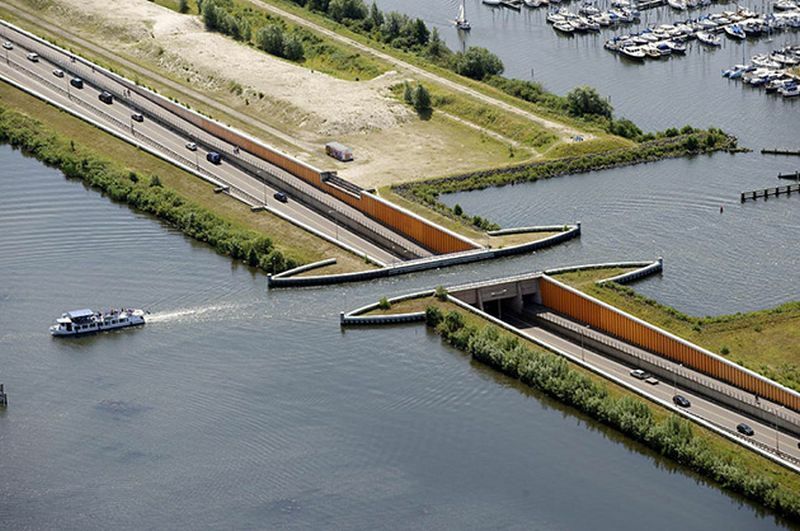 This water bridge Holland is a remarkable achievement of Dutch civil engineers. It is located in the Haarlemmermeer Municipality; Ringvaart Aqueduct is the oldest water bridge in Netherlands. Though built in 1965, two portions were added in the year 2006, and the bridge is now 5905 ft long. One of the most impressive water bridges of the world was built in 1821, which makes it the oldest and longest water bridge in Scotland. In the UK, it is the second longest water bridge. It is 810 ft long, 86 ft high and 50 ft wide. It is named Avon as it crosses the Avon River at Linlithgow, Scotland. This amazing waterway has to be experienced and if you’re ever in Holland, you must make it a point to go over this bridge. It’s a unique road as well as water bridge. 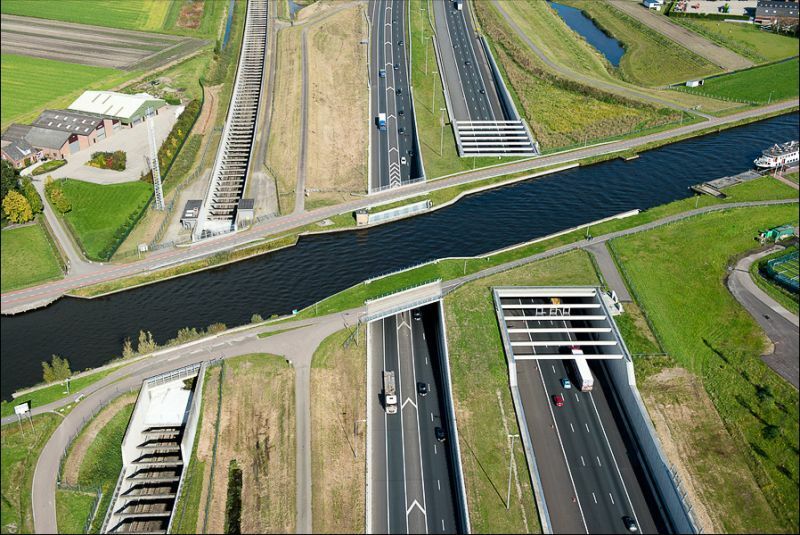 The water bridge goes over N302 road in the eastern Netherlands, near Harderwijk. It is 19 m wide and 25 m long, and links Flevoland to mainland Holland. Flevoland happens to be the biggest artificial (or man-made / reclaimed) island on Earth. This water bridge Holland is certainly one of the most impressive water bridges of the world. The bridge design is unusual, as it allows for continuous, pedestrian, vehicle and boat passage. The design is admired by architects all over the world, as it was made in a small budget, and solved both water and road traffic problems. Another name in the list of the most impressive water bridges of the world; this water bridge is situated in Wrexham Country in Britain. 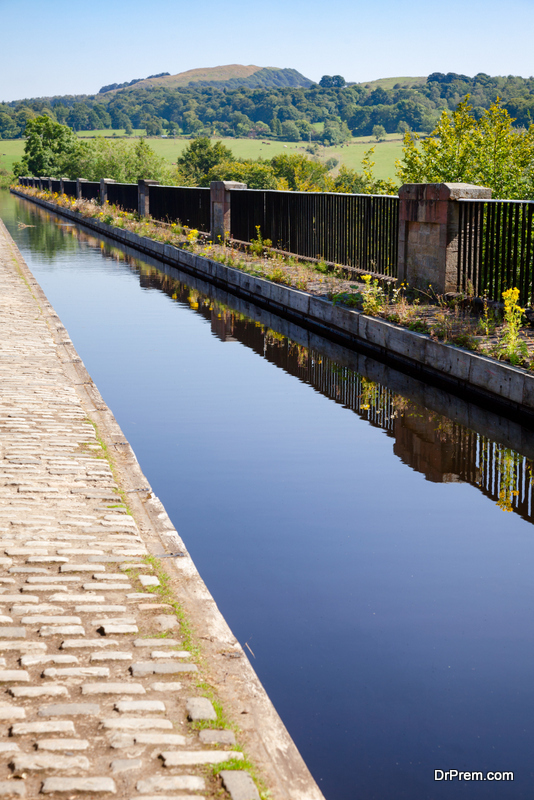 Built between years 1795 to 1805, it carries Ellesmere Canal over Dee River and was originally built to connect Denbighshire coalmines to Britain’s canal system during the roaring industrial revolution. This awesome bridge is now considered a World Heritage Site, and remains a sight to be seen. It was built using both wrought iron and cast iron and the iron-arched ribs are carried elegantly on 19 hollow pipes. The use of iron made the bridge strong and able to endure the ravages of time. This wonderful water bridge is no longer used to move limestone and coal or any other cargo, but has been maintained as a tourist attraction by the British Waterways. The Oresund bridge is a remarkable underwater bridge which connects Sweden and Denmark. 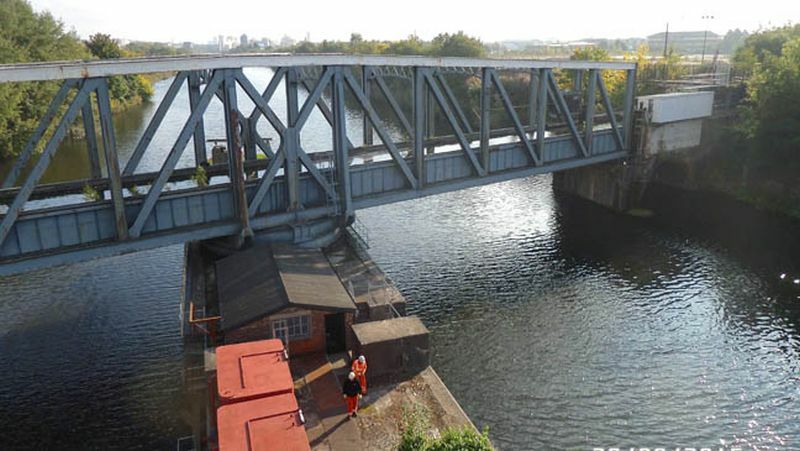 The bridge is for railway, motorway and waterway, and half of the bridge is under water to enable boats to pass. It runs from the Swedish artificial island Peberholm to Amager, a Danish island. 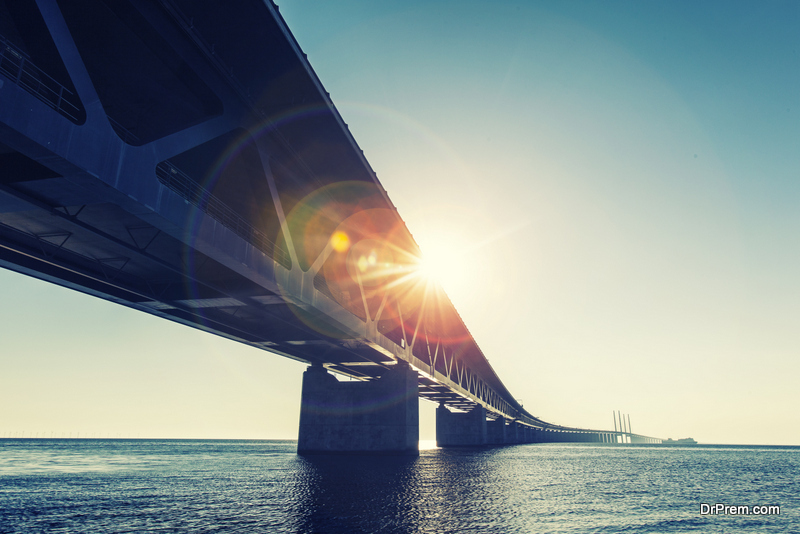 The bridge is also the backbone for transmission of internet data between Sweden and Central Europe. The Euro route E20, an international roadway crosses the bridge via road, and the Oresund line is the railway line that crosses this phenomenal bridge. The underground tunnel section was built so that air traffic would not be hampered, and also because ships could move easily pass, in all kinds of water. The Danish firm COWI designed this amazing bridge. It has also won the IABSE Outstanding Structure Award. 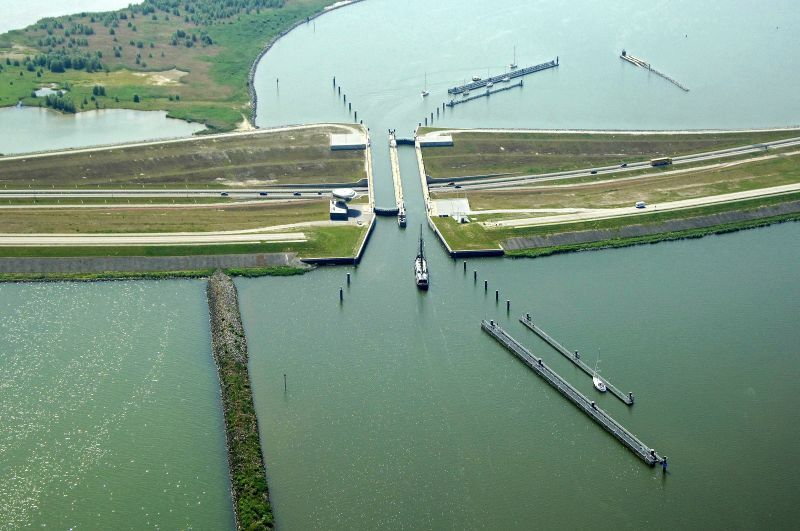 This is the first naviduct in the world, meaning a waterway that has a lock, near Enkhuizen Holland. It is an ingenious construction as it was built in order to connect two nearby lakes on different levels. The water bridges of the world are architectural wonders, which are extremely beautiful as well. They perform a useful function of enabling a smooth passage for boats and ships. The design of water bridges has evolved over time, and we can only admire the technical expertise and aesthetic design sense of the architects.